Comedian Mary Radzinski outside one of her regular haunts, Good Good Comedy on North 11th St.
For years, Mary Radzinski led a double life. By day, she was a mild-mannered pharmaceutical rep, punching the clock, doing whatever pharmaceutical reps do. By night she was building her rep as a stand-up comic, telling dry, slyly dark jokes at Center City's Helium and other clubs in the city. "Like five years ago or so, I would have confidently answered, 'Not yet.'" "Now, I'm just like, 'Not anymore.' "
Not exactly approved pharma rep humor. "It felt like a Superman/Clark Kent scenario," says Radzinski. Only a handful of coworkers and contacts in the medical world knew about her comedy super power. To those few, she was "the comedian rep." And the rest, she says, were pretty surprised when they found out. "There was a lot of 'No way, not her,' " Radzinski recalls with a laugh. "I think they thought I had the personality of, like, a toe." 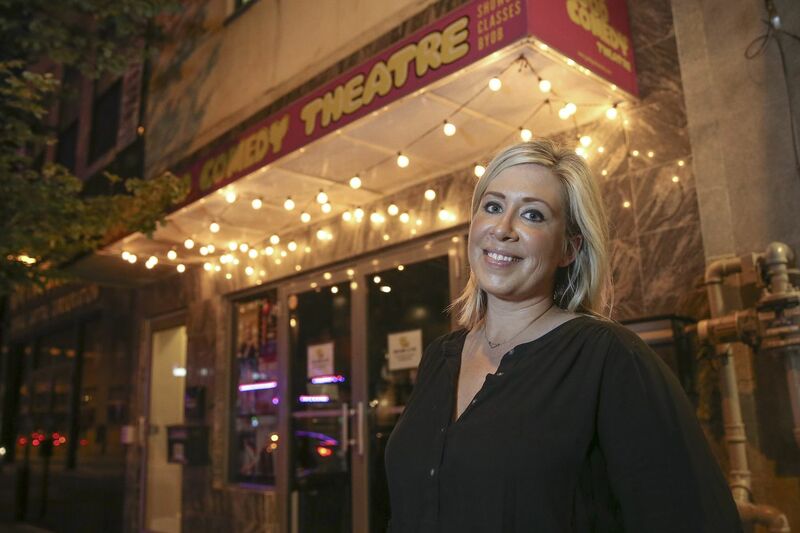 The pharma job paid the bills — and made good on her dual degrees in marketing and supply-chain management from Syracuse — while comedy provided the thrills. "I always said I was half-assing both, and that once I got the opportunity [I'd] put all my time into comedy," she says. About a year and a half ago, she got laid off and fate nudged her in that direction. "I just sort of said, 'Oh, maybe this is a sign. Or I can just pretend it is.' "
Now she spends most of her days writing (in notebooks, index cards, Google docs), keeping up on social media, networking, and trying to book out-of-town dates. This Sunday, she'll celebrate the release of her first comedy album, Discomfortable, at Helium — her "home club," as they say in the biz. That's where's she worked her way up from open-mike walk-on to host to her current position as a "featured" comedian. This means she "middles," performing a set after the host and before the headliner. It's led to plenty of out-of-town gigs at the Helium chain's other locations in cities such as Portland and Buffalo, and spots opening for well-known comics like Dave Attell, Jim Norton, and Rosie O'Donnell. "I was the first female host at Helium Philadelphia," Radzinski says. "I am bragging because it took forever." Before that, she cohosted a comedy night at Urban Saloon called Laughs on Fairmount with fellow comedian Carolyn Busa, who has since moved to New York City. Radzinski has watched plenty of her fellow Philly comics leave town for New York or Los Angeles in search of greater opportunities. She's considered it but, having worked her way up through the ranks at Helium, she has a pretty sweet gig right now. And she's seen the city's comedy scene, once dominated by sketch and improv, make room for more stand-up over the years. Radzinski grew up in a small town in upstate New York. After college, she moved to Philly with a friend and though she took notes on things she found funny, it would be five years before she enrolled in a stand-up class at Main Line School Night in Radnor, a three- or four-week course that culminated in a performance for family and friends. "My parents came into town. My brother flew in from Vegas, where he was living at the time. It was a true 'pinch me' moment," she recalls. After that it was another couple years before she tried it again, at an open mike at Urban Saloon. "And that was it. I really started trying." Discomfortable is, in a way, a culmination of everything Radzinski has built for herself since then. It's a tight mix of old and new material, the road-tested bits alongside more recent stuff. "It's kind of like a writing sample," she figures. Something she can point to when people want to know what her act is like. A hyper-local joke made the cut, about seeing a car with one bumper sticker that said "world's greatest dad" and another that said "number one Flyers fan:" "I think it's safe to assume this car has had more than one owner. Just going out on a limb." It's all about surprising the audience, she says. "I like dark. I like misdirection. I like when you don't really know where it's going." She's always adding new material, usually testing it out on smaller showcase-type shows. "I'll say 'yes' because now I'm accountable, and I have to show up there." Two weeks ago she was invited to do a 10-minute set at Good Good Comedy in Chinatown. "I could tell it was a crowd of younger people that probably haven't seen me, that I've never performed for," she says. "I wanted to just do the tried-and-true, I-know-it'll-crush [material] but I forced myself to do new stuff. Some of it worked and some of it didn't, but I was able to leave there knowing, OK, I pushed it forward a little bit." That degree in supply-chain management isn't in much use these days ("I honestly don't think I could give you a log line or anything about what that means"), but being a stand-up does sort of tap into her marketing background. "I think that's become a bigger part of it, certainly," she says. "Within Philly, I think marketing yourself is just, 'Oh don't be a [jerk] to people.' And treat the staff at the clubs well and be respectful of your time. Just being a good person. I think that goes a long way, and a lot of new comics forget about that, or don't realize it." 7:30 p.m., Sunday, Aug. 5, Helium Comedy Club, 2031 Sansom St., $15-$23, 215-496-9001, philadelphia.heliumcomedy.com.